Pt 2 “Mom, You’re registered for a full marathon!” No way! Not me!! Never! Mary and I rocking the half marathon! Finished in 3 hours 5 minutes! Two weeks before the Air Force Marathon, September 2010, my husband and I visited our Air Force son, Cody, at his base in Biloxi, MI. While there, I just had to run along the flight lines. It was so cool!! I was really enjoying the jog/fast walk intervals. (I never really understood the difference between jog and run, but I am pretty sure as slow as I was going and the minimal distance I covered each time…it was jogging.) While we visited, Cody surprised me with the announcement he was coming home to run the FULL Air Force Marathon along with several of his friends. I was so excited to know they would all be on the course and having a new experience together! But I was in NO WAY interested in ever doing that! During the half marathon, I had to make a quick potty stop. I drink plenty of water and I didn’t know to plan around the pee stops. There was a long line and it put me about 8 minutes behind Mary. I needed to catch up! So, I jogged until I found her. I don’t know what the distance actually was but I smiled often as I realized I was actually jogging a portion of a half marathon. I caught up with her and later, we crossed that finish line together and with great big smiles on our faces. We averaged 13 1/2 min/miles for the first 5-6 miles. We rocked!! I loved every minute and knew I wanted to do it again the next year. My son and his friends finished the full marathon. They were sore, they struggled up and down the stairs. I giggled at their misery. And I knew, I never needed to do that…ever!! Why?? Running (or jogging) 26.2 miles is just crazy! And look at how much pain it causes! Dah! Why would anyone sign up for that? During the Christmas season, Cody announced he was being deployed to Iraq for most of 2011. He also announced that my Christmas gift was registration for the 2011 Air Force FULL Marathon. He promised he would train while in Iraq and he would be home in time to run the full marathon WITH me. My response….”What in our entire history together would ever give you the impression I wanted to or COULD do a full marathon!!? ?” I was shocked, scared, stunned, defiant, and confused all at the same time. But he was serious! His answer, “Mom, you fast-walked a half marathon already. 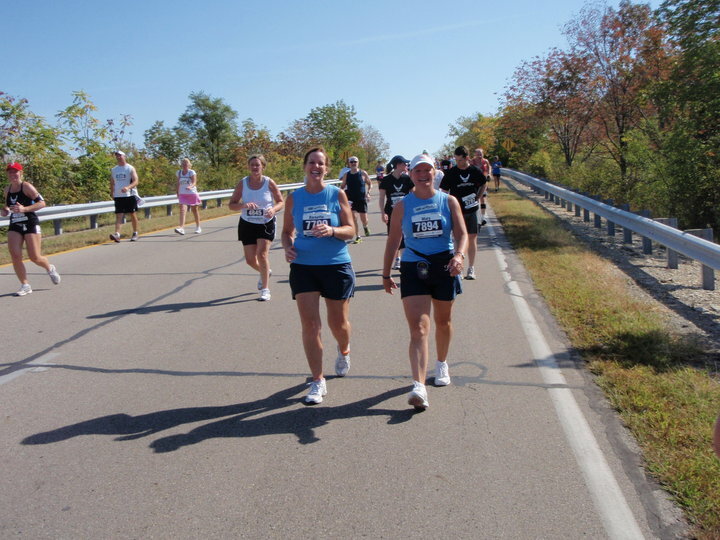 Train to run a half marathon and even if you have to walk the rest, you will have finished a full marathon.” He talked. He coached. He promised. He even drew out a plan for how I could achieve it. He deployed and I started training. Why? Because I was determined to make him proud! I was excited he would be there with me. I wasn’t going to let him down. I knew the sacrifice he was making on this deployment. All I had to do was jog. So, I took the training very seriously. I surprised myself! My intervals lengthened. My determination heightened. My confidence increased. My excitement escalated. He coaches me very well! From Iraq, he coached me how to run up and down the hills which was something I struggled with and avoided. He taught me how the mind plays tricks on us while we run, but how we can play tricks right back. Cody returned from Iraq about 10 days before the marathon. He knew there was no way he could in-process to the base and make it up to Ohio in time to run the marathon. What?? NO!! I was terrified. Now I would be alone! All my training runs had been alone but with the knowledge Cody would be with me at the marathon. Anxiety set it. Then…. I had this thought! Billy Ray Cyrus had this wonderful show called, “Surprise Homecoming”. I just knew Cody was really going to be at the marathon! I started having these fleeting thoughts and daydreams he would be there and at the finish line. It would be him who would put the medal around my neck. And….it was those thoughts that sustained me during the entire marathon. What a great show it would be…. Mom runs marathon for son. Son shows up from deployment and surprises Mom at the finish line. Whenever I felt overwhelmed with the remaining distance to run, I would think about that finish line and Cody waiting. And I’d be re-inspired and re-energized. As I rounded that final curve, ran under the wings of those magnificent planes, and headed to the finish line I was almost smiling. I knew it was almost over and I had done it. But I also knew Cody would be waiting. I saw the lines of officers handing out the medals as the runners came across the finish line. I saw a young man in fatigues peak out from one of the officers and my heart jumped! Cody!?!? I headed to that chute. As I got closer, the young man peaked again. This time I was close enough to see his face. NO!! That’s not Cody!! I cross the finish line, get my medal and look for my husband. His smile melts my heart and I hold back the tears. HE is so proud I can feel it. We hug! I am shocked I did it. I actually ran a full 26.2 marathon Who does that? 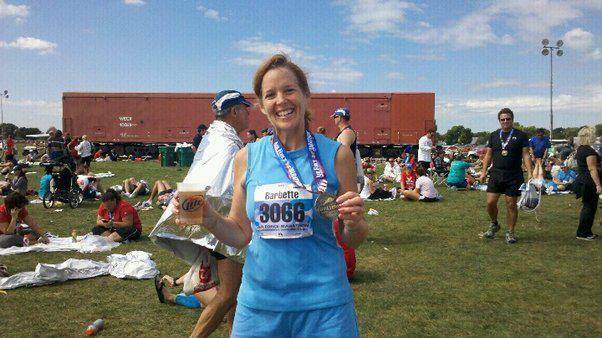 Who turns 50 and then decides to learn to run and then runs a marathon! He tells me to call Cody and let him know I finished. He hands me the phone but I can’t talk. Now the tears flow unrestrained. Within moments all four of our boys are calling or texting with congratulations. Both Cody and his twin brother, Britt, are ecstatic! They make me cry because they are so proud of me. I ran a marathon! Really!!! Oh…and that young man who was peaking out from behind the officer…he made the news! He was waiting for his girlfriend to cross the finish line. When she did, he proposed! Again, my heart melted! Posted in Blog, Why Run?